I snapped it up at my neighborhood yard sale last year for $10. Now my Mom was in the market for a footstool not too long ago, and that’s when I remembered I had this little fella in my to-do pyramid. And guess who thought it might work after all? 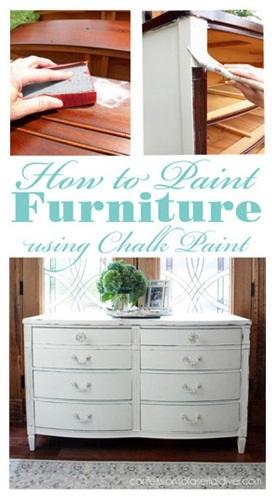 I started this makeover by painting the base and feet in DIY Chalk paint in a mix of Behr’s Cottage White and Pure White. The cover was really so simple to make. That provided a clean “new” base to go under the cover. Then I sewed each corner straight down. Now my stool has a clean fresh base. Now for the slip cover. Although the original had piping, I wanted to keep this as simple as possible. I started the same way as the muslin base cover, only I made sure to lay the fabric right side down. Then I pinned each corner. 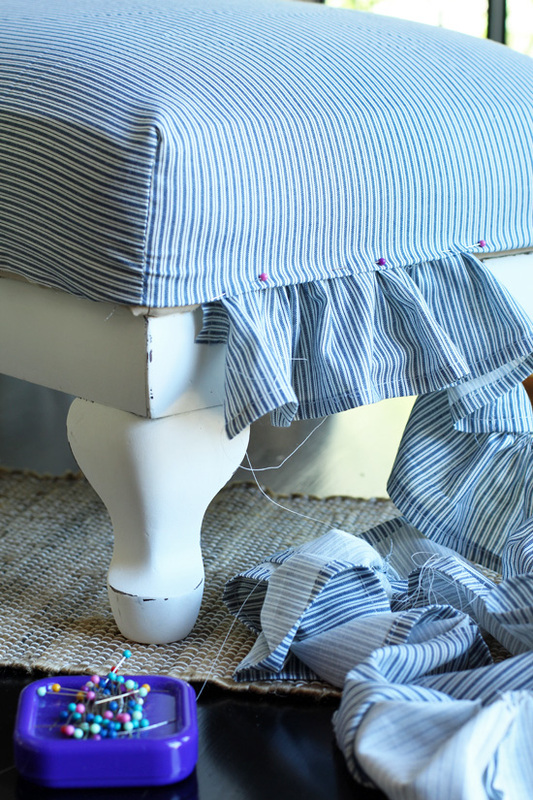 For the ruffle, I cut four inch strips at least twice the length of the perimeter of the stool, using my rotary cutter and straight edge. I had to join a few strips together to make one long strip. 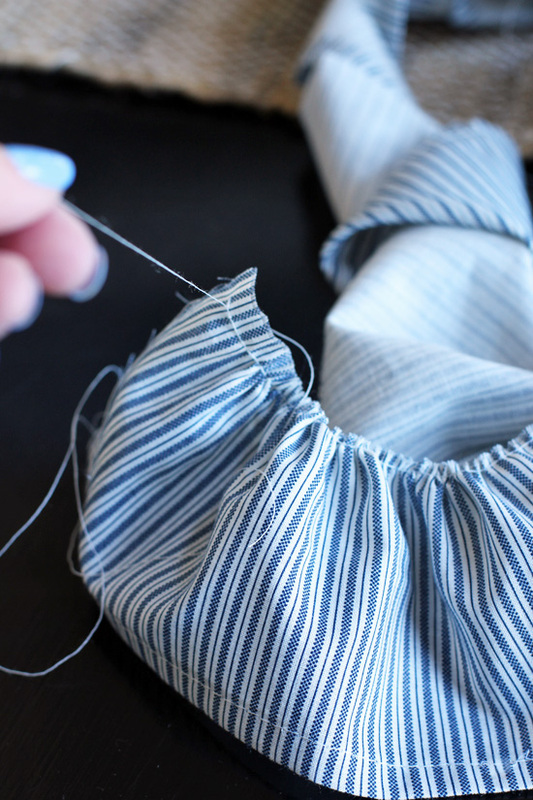 Then, of the two threads hanging off at the start, I pulled one gently and pushed my fabric along it, causing the fabric to ruffle. 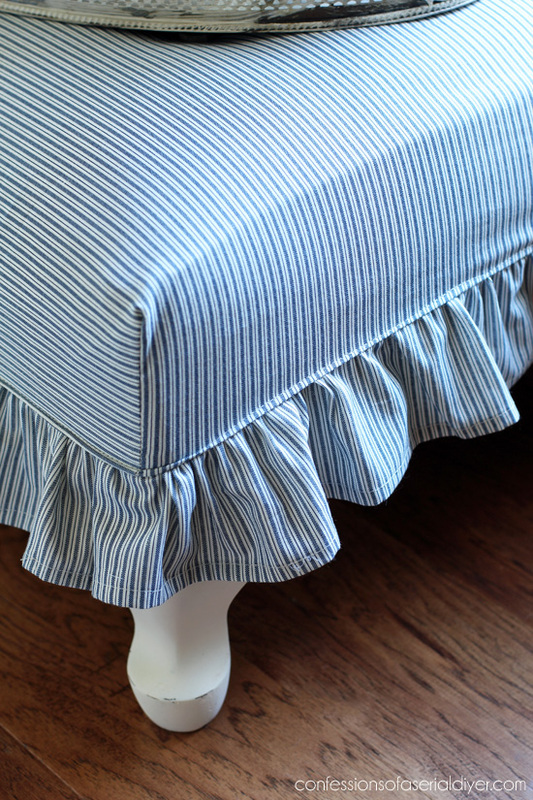 I did this until all of the fabric was ruffled. 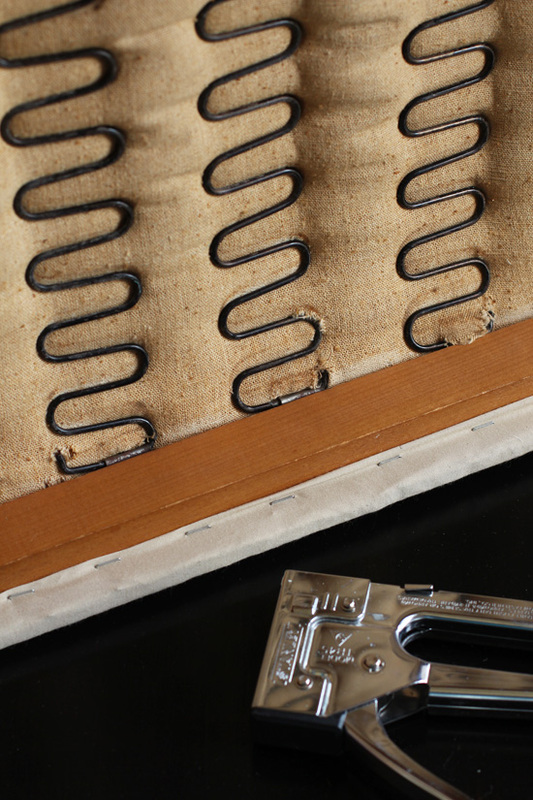 Be careful not to pull too hard or the thread will break and you will need to baste again. Then I pinned it to the underside of the stool cover. When I made it almost all the way around, I removed the cover and sewed the raw ends together. After, I ran a small zigzag stitch along the raw edges underneath where I attached the ruffle to the top part, to prevent fraying in the wash. 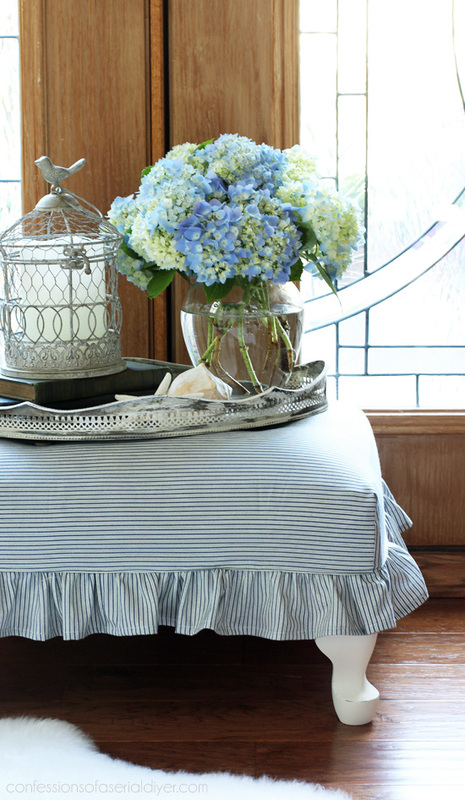 The ruffle is a bit of a throw back, but I love the charm it added to this stuffy piece. Now to see if this will end up at Mom’s house after all! 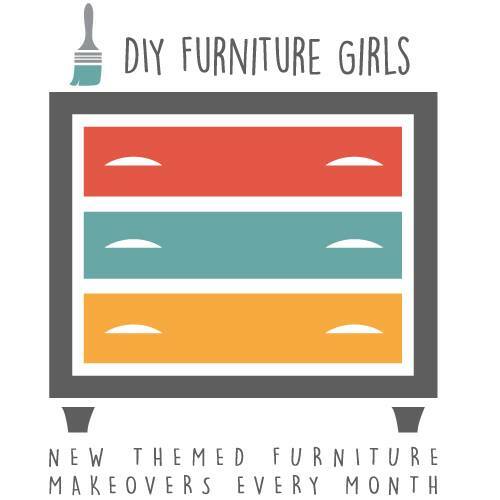 My Furniture Flippin Friends are also sharing Red, White, or Blue furniture makeovers today too! I’m working on this little table which I hope to share next time! 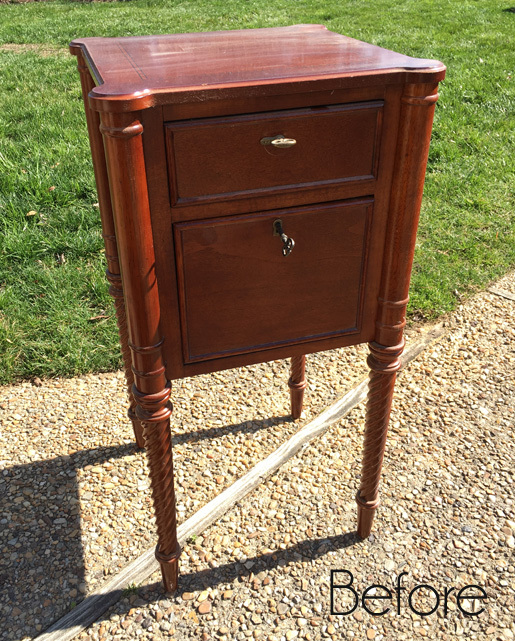 UPDATE: See this how this little side table turned out HERE now! 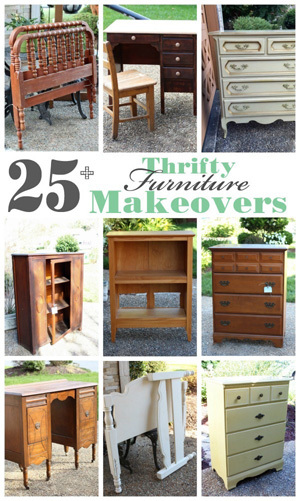 Love it Christy, now to find a foot stool at my thrift store. Your instructions are amazing. I CAN DO THIS!! Thanks for the inspiration and the great inspiration. eep! I not only love the little legs peeking out, but that ticking…my favorite! Great tutorial and project, Christy. 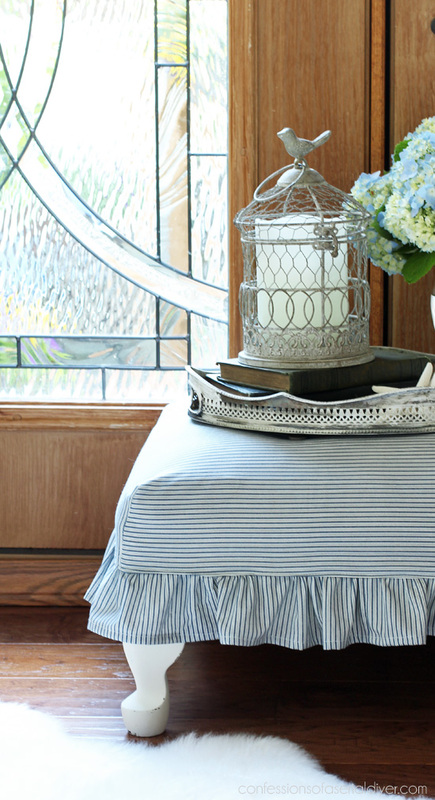 Love the ruffle on the cover and the ticking is just totally timeless and classic. 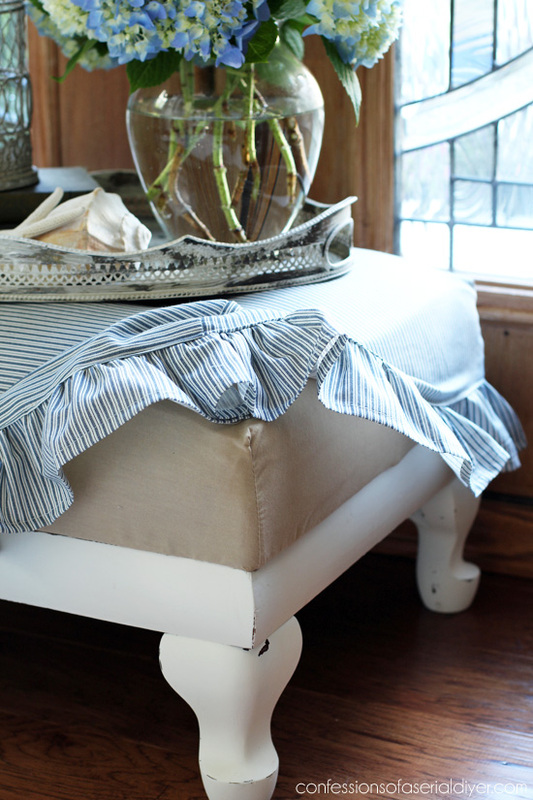 You have me itching to sew up a slipcover as cute as yours! 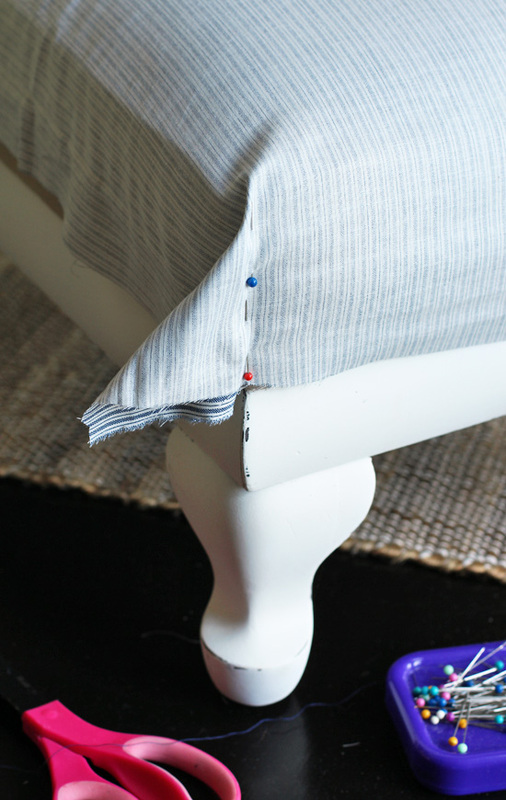 Another one of your projects that makes me want to get that new sewing machine going. I love this!!!! How cute is that! I can see how Mom would not be impressed with the “before.” You make the process look so easy, I might have to find something to recover. 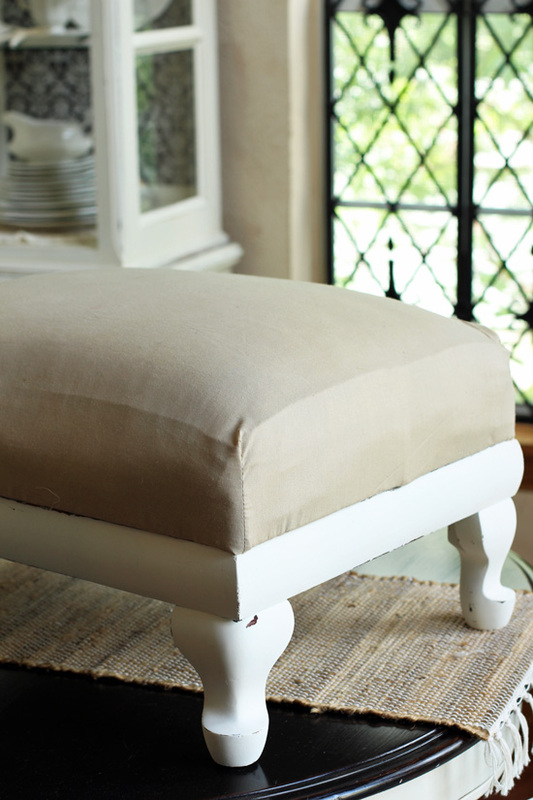 I love what you did with this footstool. Looks so fresh. I also love that you give us all the tips on how to do this Thank you so much for sharing. 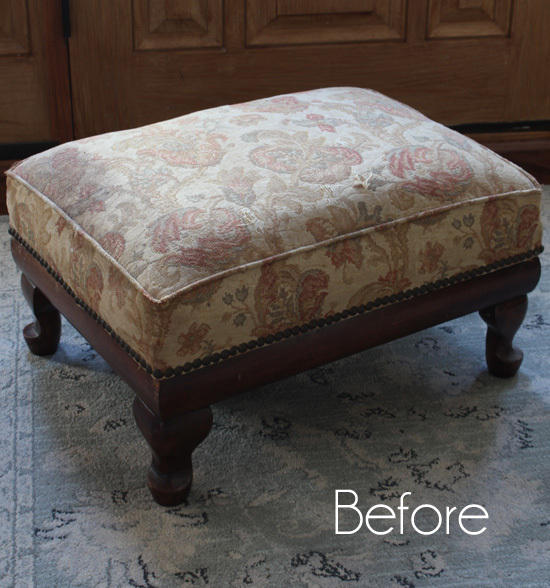 I found the same foot stool at a yard sale 2 years ago! 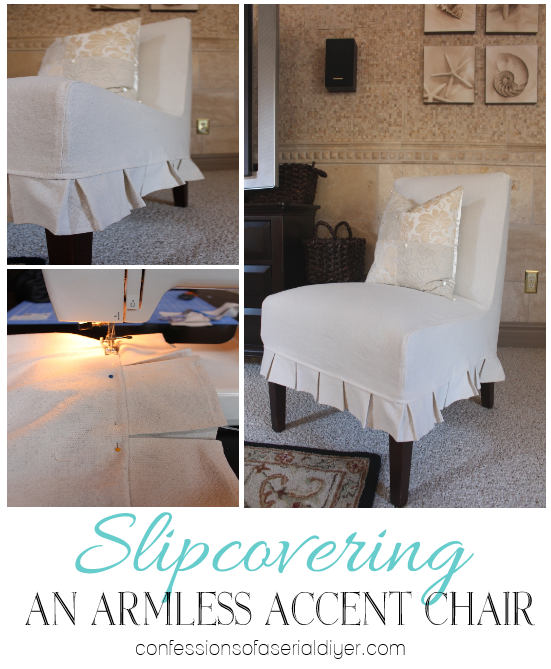 I also made a slipcover for mine as I did not want to deal with pulling off the hobnail tacks. I used a hunk of painter’s canvas and added a fussy fringe. 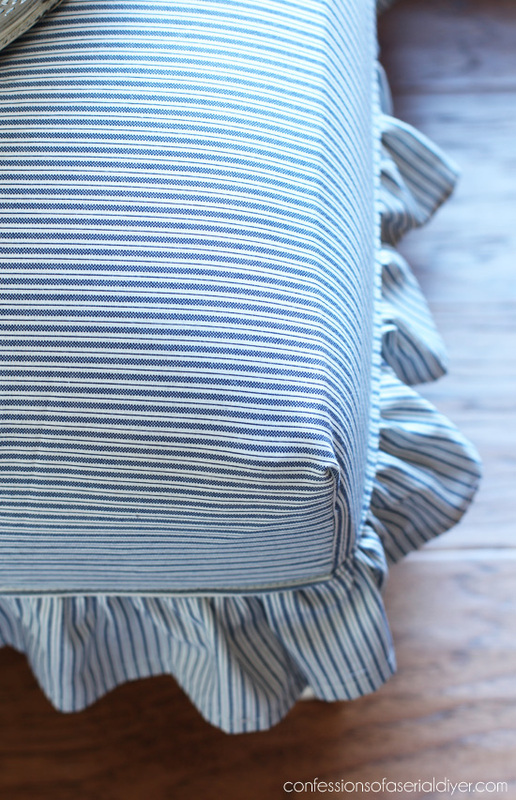 I think these little ones are so darling with that lift off storage space under the cushion. Have a great holiday weekend! Ha I never though of leaving the tacks since I was covering it anyway…I should have. Oh well…I sweet-talked my hubby into removing them for me. I bet yours is so pretty!! 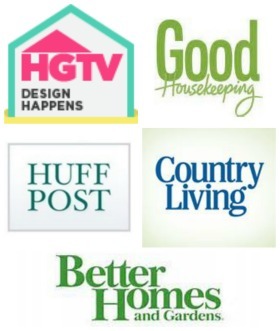 Pinning for when i find (or make) that footstool! 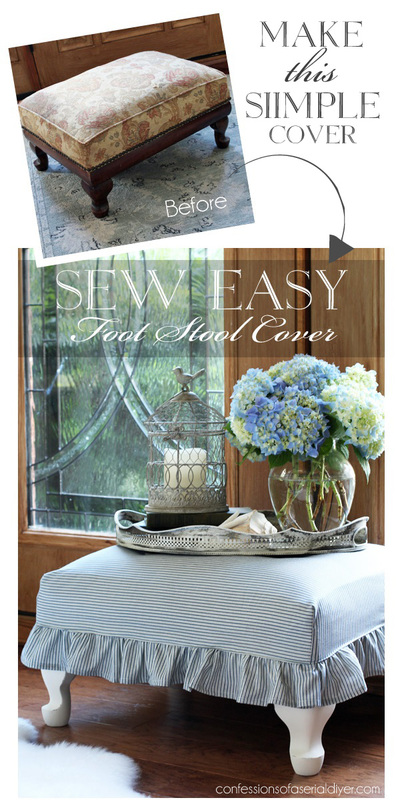 Oh my gosh Christy, I swear just last week I wanted to sew a slipcover (from an old red ticking chair slip cover) for a footstool I no longer use to take to the outdoor market last weekend. I gave up because I didn’t have the time to figure out how to sew one in the time crunch I was under. Thank you for this awesome tutorial – I can do this!!! 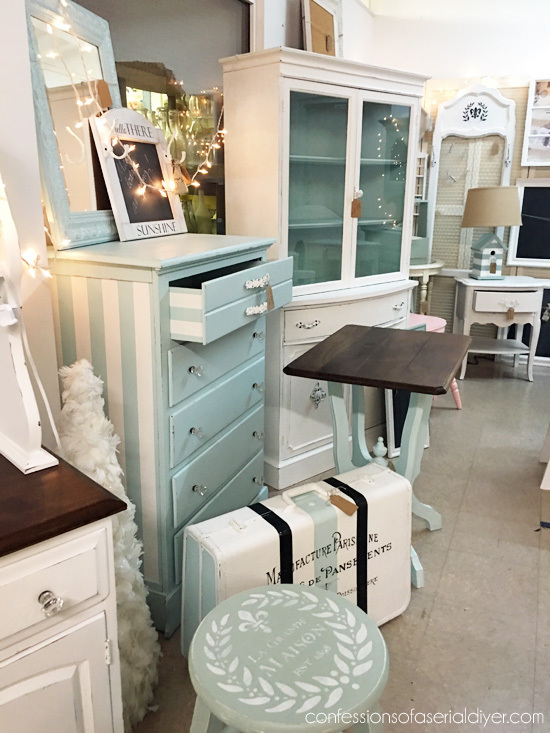 Love the transformation you gave this stool and no surprise your Mom said, yes please. 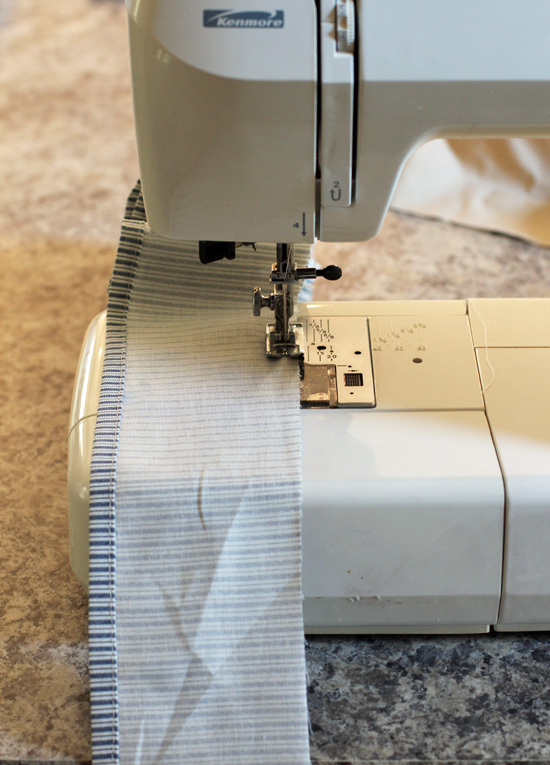 You do such clean sewing work, even underneath is perfect! So, did Mom end up with this little stool? Aren’t daughters great? I have a precious one myself, we love to do projects together and hunt for trash to treasures. She has a great eye too! Thanks again for sharing, always look forward to your projects. So cute! I love that the skirt can come off to be laundered. Thanks, Paula! 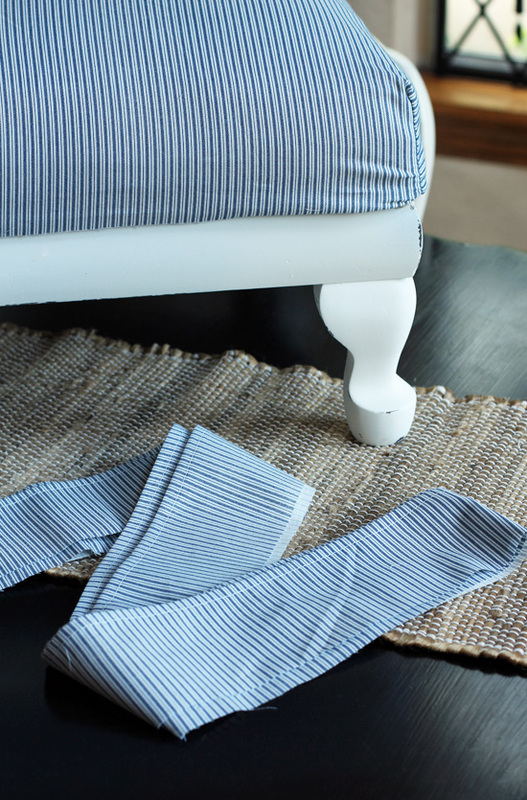 Slipcovers are so nice in that you can just throw them in the wash! Christy, I really enjoy your blog. You do such beautiful and creative things. Thanks for providing such great pics and tutorials and sharing your knowledge. Aww, how cute! I love the little ruffle! Love it! You do a great job! Christy, this is such a sweet piece! I’m not a sewer at all but you certainly did a wonderful job on this remake! This is too sweet and I LOVE the idea of an undercover! I have chairs I want to recover with slipcovers. You are too talented and creative! 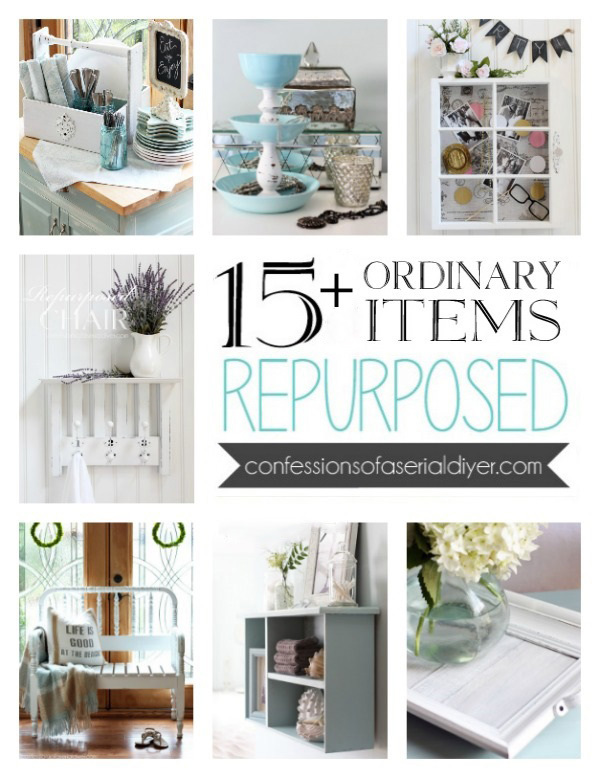 Pinned and sharing! 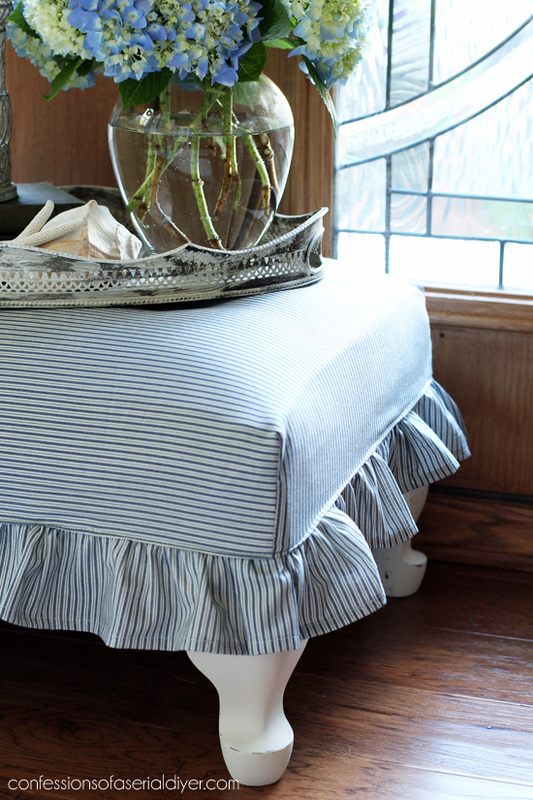 I have a couple of footstools that need re-doing and I’m going to try a corner box pleat! I love how easy you made this look and I’m hoping it is easy! 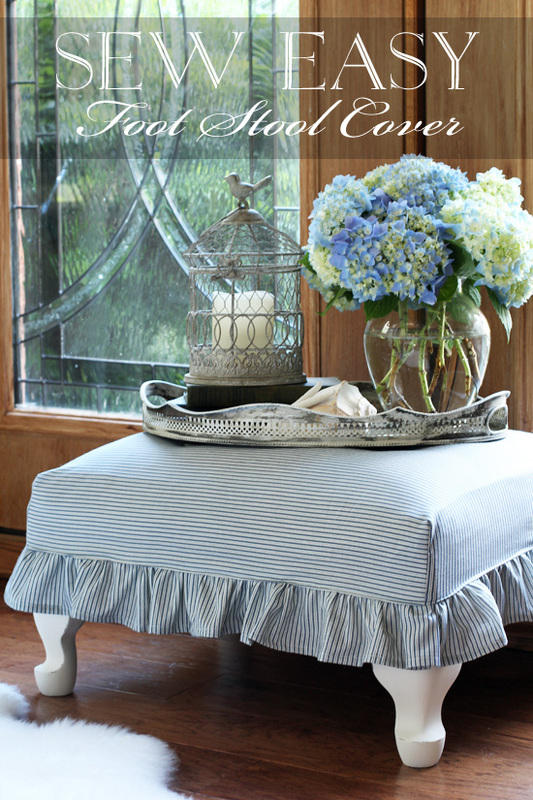 I really love the finished look of your stool! Have a great weekend! 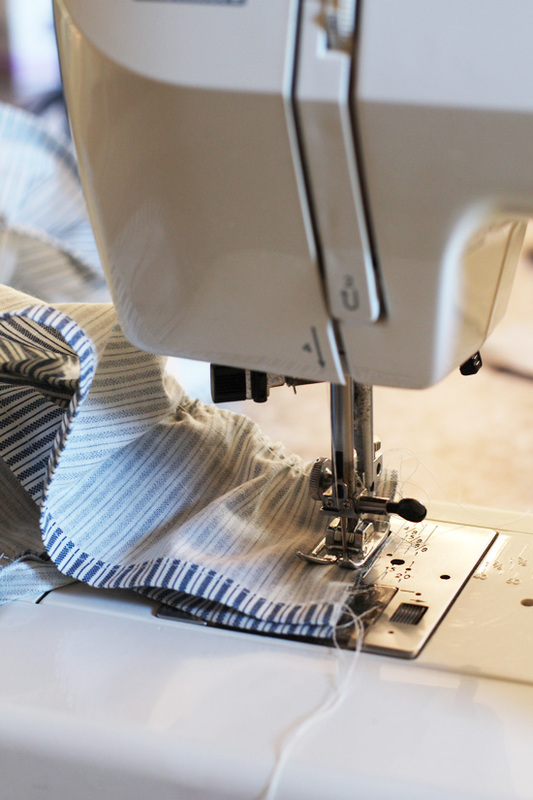 You are always such a magician with that sewing machine! This looks so sweet and fresh! Beautiful job my friend! So cute! I like those curvy little feet! 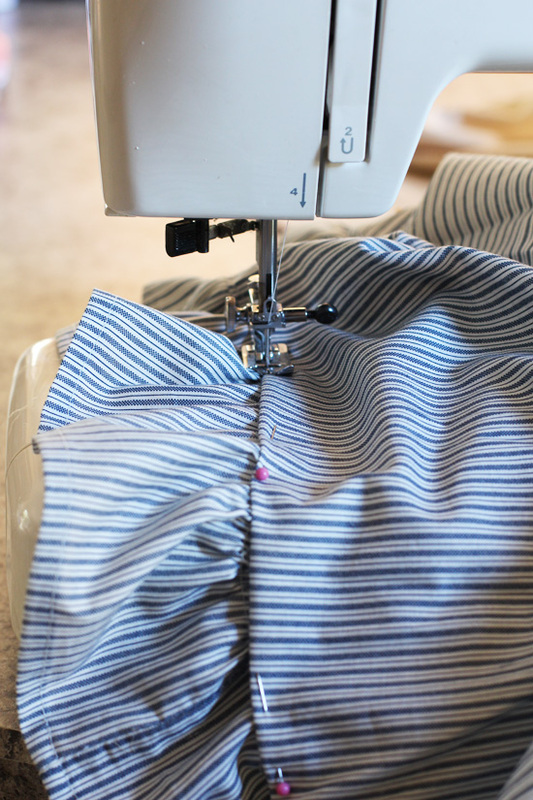 I really need to fix my sewing machine, as seeing projects like this make me crave sewing again. My daughters always make fun of how hideous some of my furniture pieces while I am working on them but somehow are the very ones begging for me to gift it to them when I am finished. Makes me happy! 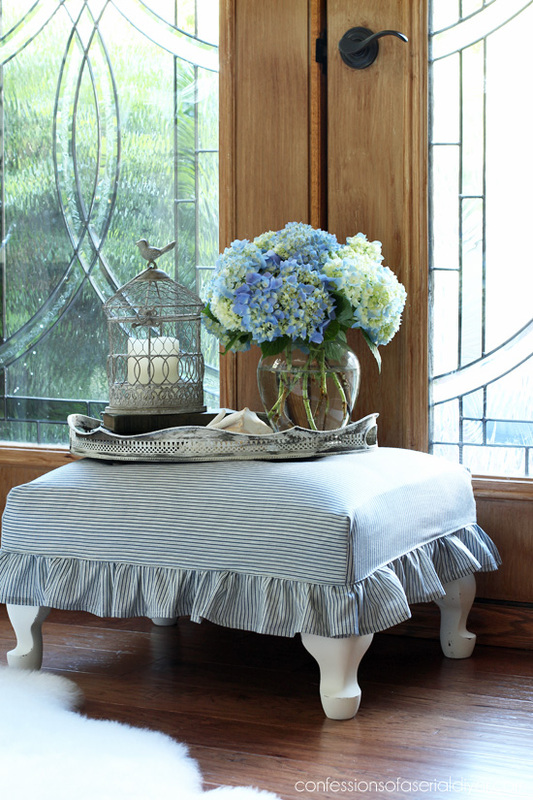 Christy, that footstool is adorable. What a sweet make-over!! Thank you for sharing it at Shabbilicious Friday. 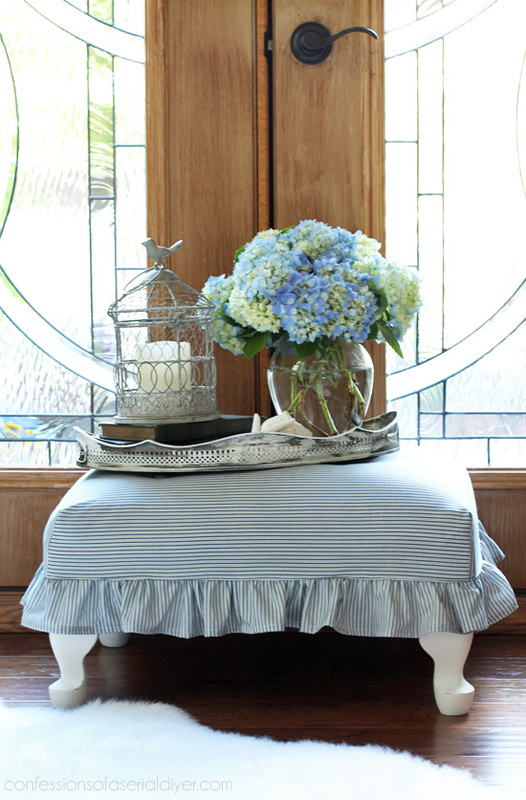 I’m delighted to be featuring your slipcovered stool at tomorrow’s party.